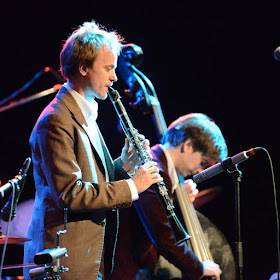 LondonJazz News: So Thom is moving on - what is the story and is it a big wrench? Jean-Marie Fagon: There’s no story, really, it’s more a natural progression. Thom’s classical music commitments are so intense that he was finding it increasingly difficult to devote much time to the Quintet. We have played numerous gigs without Thom, a kind of “Man Overboard Quartet + guest”, and it has worked really well, we’ve got a great pool of musicians we can call on. We’ll continue doing that, because although we now have Fiona Monbet on board she’s based in Paris at the moment, so she won’t be able to do all of our gigs. So it’s a wrench in the sense that we’ve had some great times with Thom, but it’s also new beginning, which we’re excited about. LJN: Who is Fiona Monbet ? J.-M.F. : Fiona is an exceptional violinist. 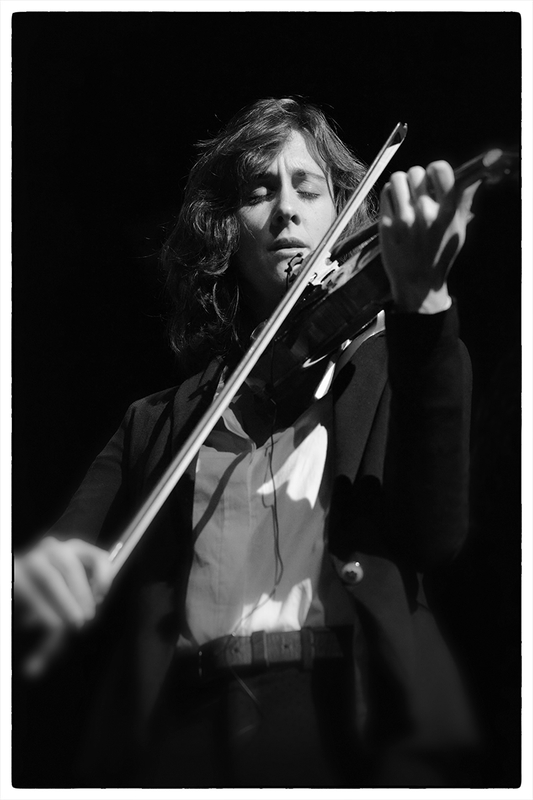 She studied with Didier Lockwood, who supported her career when she started playing jazz. She won the SACEM’S “Young talent Award” 3 years running (2005, 2006, 2007) and has played numerous high profile gigs with very good players. It actually was Thom who introduced Fiona to us. We played a couple of function gigs with her a couple of years ago, when she was based in London, and of course she was with us for our gig at the Festival Jazz Amarinois in Alsace late last year. She fits in so well with the band it wasn’t a difficult decision to ask her to join us. LJN: The video was at Amarinois – is it a good festival - was that an important gig for you? J.-M.F. : The Festival Jazz Amarinois, which takes place in October not far from Mulhouse in the Alsace, has been happening for the last 7 years. It’s a great event, specialising in New Orleans and manouche jazz, and runs over 3 days. People come from all over the world to enjoy the music. There was a big article about it in a prominent US Jazz publication last year. The journalist who wrote the article attended our gig there, and I think he liked it. So yes, it was an important gig for us, one we feel might open a few doors. LJN: And she presumably opens doors stylistically? J.-M.F. : Stylistically Fiona is actually very similar to Thom, so there won’t be major changes there. LJN: And new opportunities too? J.-M.F. : Inevitably a new band member brings new contacts, and new fans, so who knows? We’ll certainly be playing in Europe a lot more. LJN: You are a very busy band ? You all still have fun together ? J.-M.F. : 2015 was a busy year for us. A new album, a collaboration with the Aurora Orchestra, live appearances on In Tune, and many gigs. So yes, we’re still having fun. LJN: Have there been high points ? J.-M.F. 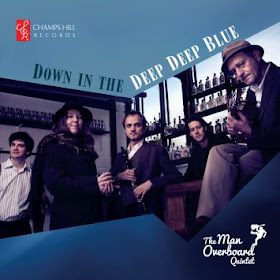 : The new album Down in the Deep Deep Blue was definitely a high point. The choice of material was a bit risky, with far less well-known tunes than we played on the first album. But it seems to be doing well, copies are being shifted, and we’re getting great feedback on it. LJN: And presumably quite a few laughs along the way? J.-M.F. : Being the general organizer for this band always involves a combination of stress, joy, and good belly laughs. Our trip to France last year was epic, in this respect. Getting everyone to catch early trains and generally be where they needed to be when they needed to be there was very stressful indeed, and the gig itself was a complete joy. As for laughs, I’ll only mention Louisa coming out of her hotel room just before the gig, looking sharp with a black hat and black dress, but also looking devastated as she stood there holding a black shoe in each hand. I immediately spotted the problem; one leather brogue, one satin slipper, shoes from different pairs. So I told her there was nothing we could do about it, she’d just have to wear odd shoes, to which she said “I can’t, they’re two left shoes”. For the record she did the gig in great big brown hiking boots. LJN: Brian Blain recently wrote: "The counter-revolution has well and truly broken out"..Do you feel that Man Overboard is part of a broader trend? J.-M.F. : There are a lot of bands around that play a more traditional type of jazz, but I don’t think it’s a trend. We don’t play the type of music we play to make a statement on the merits of old style jazz. We play it because we love it. I’m sure the people who play experimental jazz, for example, do it for the same reason. What I think is wrong in the debate that’s been going on, the “modern vs traditional” debate, is that it tries to pit one against the other. Surely the whole thing’s a matter of personal taste. I can bore people silly by going on about the richness and depth of swing music, just as I’ve been bored silly by people going on about the need to constantly push musical boundaries and challenge the audience. I think there’s room for every type of music, and within jazz there’s room for every style. LJN: What gigs / landmarks / excitements coming have you got coming up? J.-M.F. : We’ve got a few interesting things in the pipeline, some more firmed up than others. Our music used as the soundtrack for a BBC1 documentary, a residency in an exciting new venue, that sort of thing. All will be revealed in good time. J.-M.F.…et de plus en plus féminin.